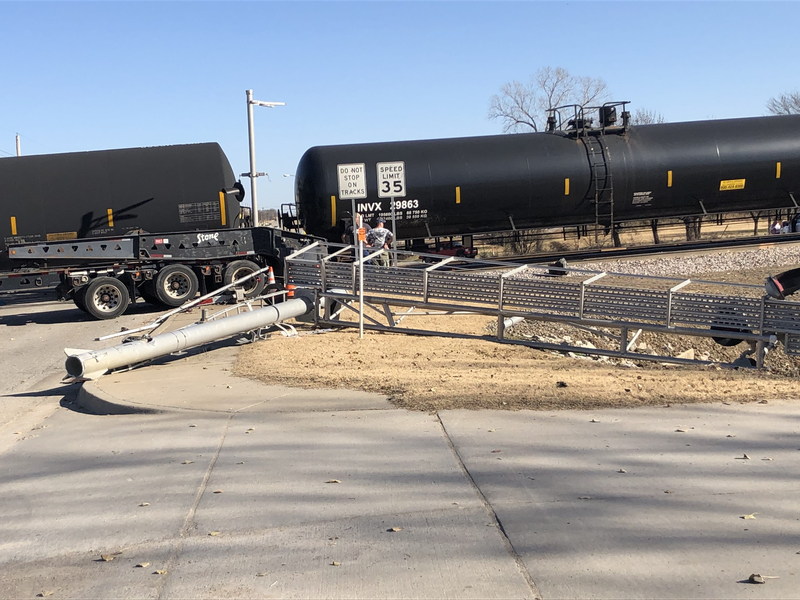 Early Saturday morning, the sound of twisted metal and asphalt filled the air as a Burlington Northern Santa Fe train collided with a Stone Trucking flatbed trailer that had stalled on the tracks just south of Kiefer at 151st, near alternate 75. At about 8:00am, the flatbed trailer was hauling a large heat exchanger when the driver said the brakes locked up, causing the trailer to get stranded on the tracks. The driver was able to exit the truck and flag down a police officer, but they could not make contact with an oncoming train in time. According to Kiefer Police Chief O’Mara, the train hit the trailer at 43 miles per hour, giving the train engineer minor injuries. The driver of the semi truck was unhurt. A second train was forced to stop later that morning as crews continued to clean up debri well into the afternoon. Police are still not sure what caused the trailer to become stranded on the tracks, and witnesses say that Stone Trucking is not supposed to cross those tracks anyway, because the difference in elevation between the road and the tracks that cross it might be just enough to bottom out a trailer. BNSF is said to be conducting an internal investigation.